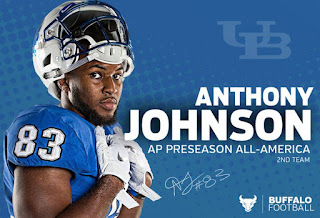 BUFFALO, N.Y. -- University at Buffalo standout wide receiver Anthony Johnson was named to the Associated Press Preseason All-America Team on Tuesday. Named to the second team, Johnson became the first player in school history honored as an AP Preseason All-American. Johnson was one of just three players from the Group of Five named to the first or second team. He joined Houston defensive tackle Ed Oliver (first team) and Wyoming safety Andrew Wingard (second team). Johnson had 76 catches for 1,356 yards and a school-record 14 touchdowns last season. He ranked second in the nation in receiving yards per game (113.0) and third in receiving touchdowns (14). The All-MAC First Team selection had six games of 140 or more receiving yards which was tops in the country. In July, the Rock Hill, SC native was named to the preseason watch list for the Maxwell Award, given to the best player in college football as well as the Biletnikoff Award, given annually to the nation's top wide receiver. The 2018 season kicks off on September 1 against Delaware State at UB Stadium. For tickets contact the UB ticket office at 1-877-UB-THERE or click here.